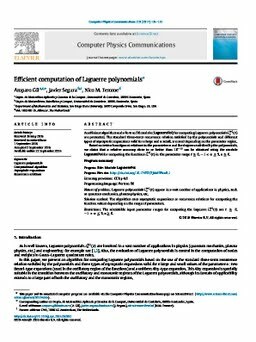 An efficient algorithm and a Fortran 90 module (LaguerrePol) for computing Laguerre polynomials . Ln(α)(z) are presented. The standard three-term recurrence relation satisfied by the polynomials and different types of asymptotic expansions valid for . n large and . α small, are used depending on the parameter region.Based on tests of contiguous relations in the parameter . α and the degree . n satisfied by the polynomials, we claim that a relative accuracy close to or better than . 10-12 can be obtained using the module . LaguerrePol for computing the functions . Ln(α)(z) in the parameter range . z≥0, . -1<α≤5, . n≥0. Program summary: . Program Title: Module . LaguerrePol . . Program Files doi: . http://dx.doi.org/10.17632/3jkk659cn8.1 . . Licensing provisions: CC by 4.0. . Programming language: Fortran 90. . Nature of problem: Laguerre polynomials . Ln(α)(z) appear in a vast number of applications in physics, such as quantum mechanics, plasma physics, etc. . Solution method: The algorithm uses asymptotic expansions or recurrence relations for computing the function values depending on the range of parameters. . Restrictions: The admissible input parameter ranges for computing the Laguerre . Ln(α)(z) are . z≥0, . -1<α≤5, . n≥0.